India has no dearth of travel destinations. Some of them are more famous and more commercialised than the rest. But it does not imply that the lesser-known places have anything less to offer; instead it just makes you realise that they haven't been tampered with by large crowds of tourists yet, making these lesser known destinations great to explore and enjoy! There are many places within our country that still remains to be explored by the tourists. You may know of them or might have heard of them, yet, are you reluctant to actually make the journey? This is what you need to know about the pristine beauty of the places that aren't crowded by tourists. The below guide of places that are hidden treasures will ensure you pack your bags right away! Gorumara in Dooars is a beautiful forest and a highly recommend weekend destination. You can head to the National Park here with your children and enjoy the beauty of the jungle. If you are lucky then you can catch a glimpse of rhinos, Gaurs and elephants. Jeep and elephant safari are provided to take you across the forest and help you sight wild animals. An Indian Bison spotted at Gorumara National Park. Located amongst the pristine beauty of the Nilgiris, this unknown paradise is known for it's exotic tea production. This extraordinary village is covered with beautiful hills, glistening rivers and soothing waterfalls that make it a perfect place to head to for relaxing and rejuvenating yourself. Also it is less frequented by tourists and therefore the natural beauty of this place is not tampered with. 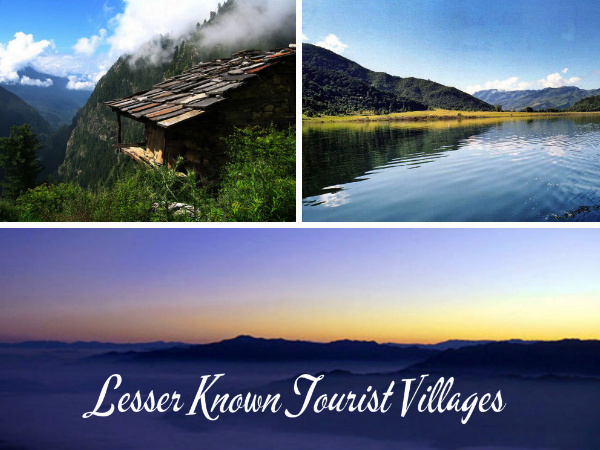 Malana is situated at an altitude of 3,029 mt above sea level, on the banks of the Malana River. It offers mesmerising views of the Deo Tiba and Chandrakhani peaks. According to folklore, the village of Malana was founded by soldiers of the army of Alexander III of Macedon and it is also believed that the natives are the descendants of Alexander's army. The natives of the region follow unique customs and traditions, that is a significant feature of this place. Interacting with the natives is the best way to comprehend the culture and the customs they follow. Being in Malana, travellers can enjoy trekking and other activities. Offering treks up to a height of 3,300 mt, this town is a paradise for hikers and nature lovers. Located near Mandi, it is a great place for trekking, skiing and mountaineering. Covered with a dense canopy of deodar and fir trees, it presents a charming picture during winters. The Shikari Devi Temple is a must-visit here. Go trekking through the mountains. Phawngpui or the Blue Mountain of Mizoram is a highly revered peak and considered to be the abode of the gods. It is famous for its spectacular view of the trees and flowers of all colours. Travellers coming here are left speechless by the sight they get to see and are often heard saying that this place is like heaven on earth. It is a perfect getaway for those who are in search of tranquillity as the region is not frequented by many tourists. The beauty of nature also makes this place a perfect relaxing spot. Rih Dil also known as Rih Li is a beautiful heart-shaped lake that is located in Myanmar. This lake is believed to be the passage to heaven for the souls of the dead. There are several folktales that surrounds this amazing and picturesque lake. It is a rarely visited place because of the difficulty in accessing the region. Public bus facility has been provided from the Indo-Myanmar gate that will take you to the Rih. You can also get permission to visit the lake from the Deputy Commissioner's office at Champhai.